It’s Not Bragging if You Have the Pictures! We had finished the range portion of the NRA Basic Pistol class Phil Epps and I had taught Sunday and had the range for a few more minutes. 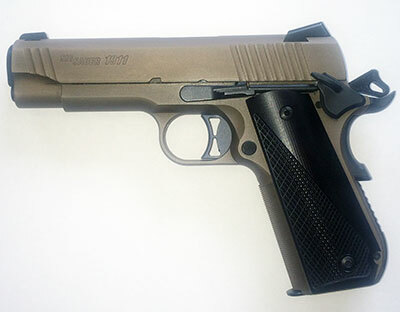 This gave me the opportunity to do a little follow up testing regarding my Sig Sauer 1911 Scorpion Commander. On a recent trip to test various magazine/ammunition combinations I had discovered that Fiocchi jacked hollow point rounds did not feed reliably in that particular gun. Since every other type of ammunition I had tried worked fine, I was puzzled. When I got the gun home and began looking for the source of the problem, I didn’t find one. In fact, when cycling the gun by hand, it fed those rounds with no problem. So, now back at the range, I ran a target out to ten feet or so, loaded eight Fiocchi hollow points in one of my Colt magazines and left whatever was already in the chamber there. Why was one in the chamber? It was my carry gun for the day. I started shooting with my typical two-hand grip, unsupported and after 4 shots there had been no issues with feeding the rounds. But there was something else. The target had a single quarter-sized hole in which all four rounds had converged. I called Phil over and got him to take a picture with his IPhone. After getting that benchmark, he snapped a photo after each of the remaining shots in the magazine. After all nine rounds, it was a pretty impressive target. I went on to shoot some more and a couple of our students who had hung around to watch were given the opportunity to shoot the gun as well. The final target had a big fist-sized hole in the center with a couple of flyers in the inner orange ring. I could be just bragging on me a little, but what I’m really bragging on is the gun! My 67 year-old arthritic hands aren’t always able to hold a handgun absolutely steady, but I was having a pretty good day that day. The gun was having an amazing day. But, I’ve noticed that about Sig Sauer pistols, at least the ones I own. They always make me look good! 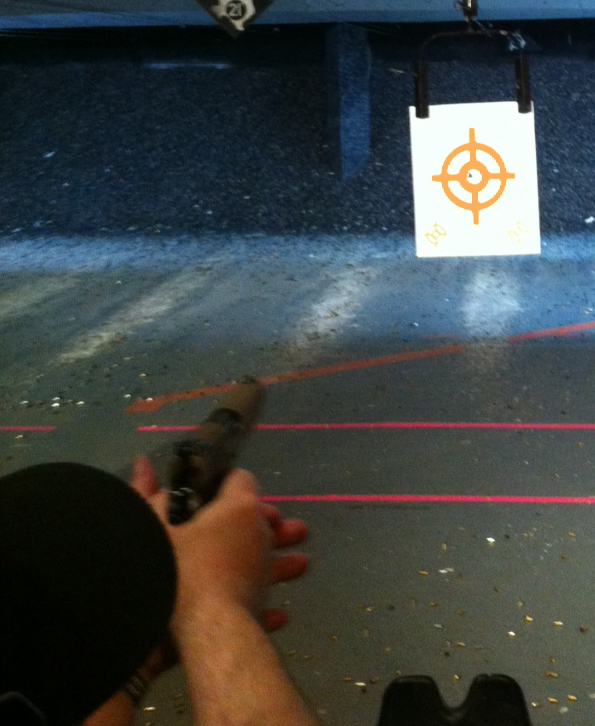 I had a chance to shoot the Sig again today as we were wrapping up a CHL class. I had approximately 20 rounds of mix and match ammo. It included some Sig Sauer JHP, Speer Gold Dot JHP and Hornady Zombie ammo, which is basically their Critical Defense. I fired 20 rounds during the timed portions of the CHL class, 1 round every 2 seconds and 2 rounds every 3 seconds. The target was at the 9 foot range. The end result looked like 10 rounds had been fired, all well within the 10 ring. The first three shots were in a hole the size of a quarter, then I pulled the 4th one off about 2 inches. The next 10 rounds essentially filled out the first holes. This is one accurate firearm! Next Next post: Slide Lock or Slide Stop? David Freeman Blog at WordPress.com.